Your party guests will love this recipe for Avocado Chicken Salad Pinwheels. Creamy chicken salad rolled up in tortillas for a healthy game day appetizer or lunch/dinner for your whole family! Avocado Chicken Salad Pinwheels are a great appetizer, light lunch, or even for a picnic (if it’s cold where you are, let’s say an INDOOR picnic)! 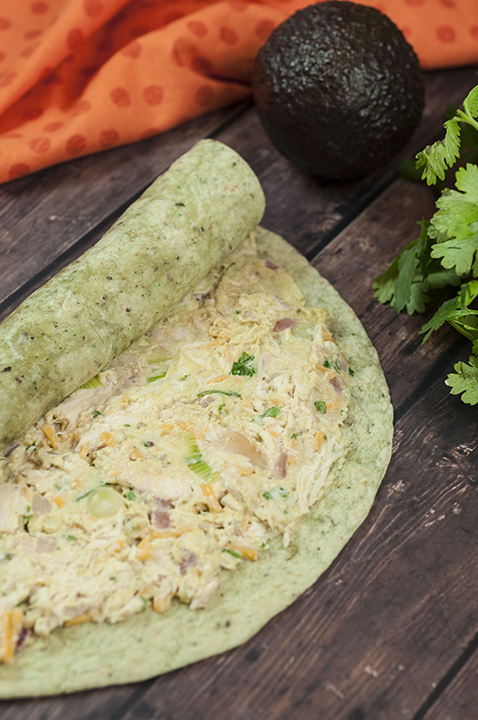 Tortillas rolled up with a creamy avocado chicken salad with a little bit of added cheese. Your whole family will go crazy for these. I LOVE wraps (like these 15 minute Avocado Caprese Chicken Wraps), but pinwheels just look prettier and are more fun to eat. Pretty food tastes better, right? They are so good that I had to share today – I couldn’t go one more day without you knowing of their existence. 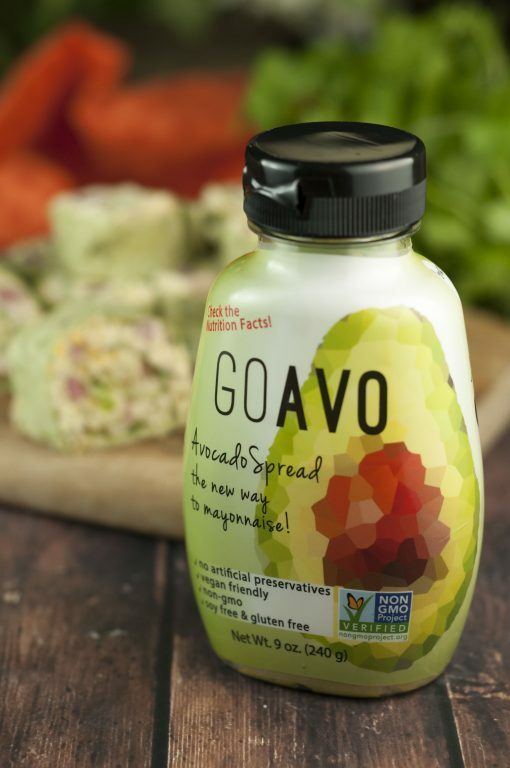 Have you had a chance to try GoAvo spread yet? I know it’s been a while since I’ve shared a recipe for you all using GoAvo and its LONG overdue. I have great news for you if you haven’t gotten your hands on a bottle of it yet. My friends over at GoAvo just informed me that their product is now available in Kroger stores! I always pick mine up at Wegmans since I do not have a Kroger store nearby, but this just means more options and more people can enjoy my favorite spread! I absolutely LOVE GoAvo and think it’s a genius idea. I’m also a giant fan of avocado, so, there’s that. Give me anything avocado and I am one happy food blogger. When you combine it with chicken salad, now it just doesn’t get much better than that. In case you haven’t tried it, GoAvo has the flavor profile and consistency that is similar to mayonnaise or an aioli sauce. GoAvo can be a simple replacement for either of those two things in a recipe (egg salad, tuna salad, and more) or just simply as a spread for your sandwiches/subs. Sometimes I like to just spread it on a sandwich or on toast to give more flavor and creaminess. It really cuts down on the fat and calories when you use it in replacement of mayonnaise! Mr. Wishes loathes mayo and thinks whoever invented it was completely devoid of taste buds. Needless to say, he’s all about GoAvo. 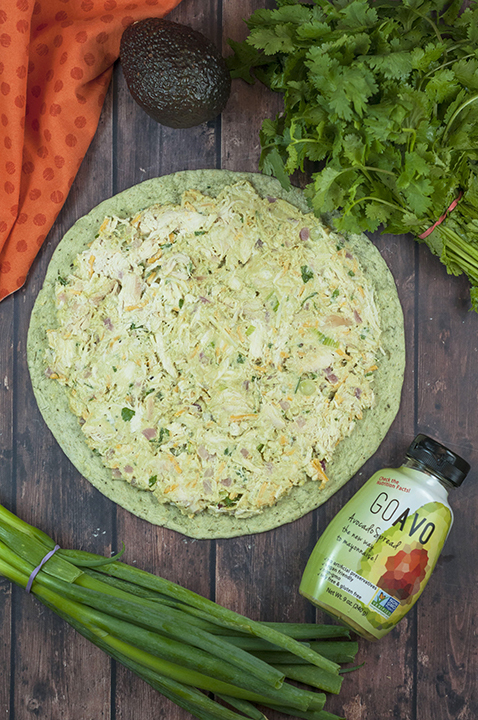 GoAvo comes in three different flavors – Original, Basil, and Jalapeno. It is an all-natural avocado-based condiment and eggless mayonnaise alternative. Each bottle contains ~85% avocado (other ingredients are grapeseed oil, white wine vinegar and lemon juice). 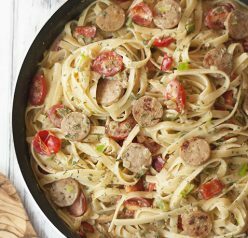 I just love the perfectly creamy texture coming from such simple ingredients! Also, one tablespoon of GoAvo is 25 calories versus 90 calories in one tablespoon of mayonnaise. Sign me up! These Avocado Chicken Salad Pinwheels really are such a classic party appetizer, but I have made a meal out of them (lunch or dinner) and are a great healthy option to pack in your kids’ lunchboxes. Kids can even make these themselves as they are so easy to put together…and fun to roll! Chicken salad is more fun to eat when in pinwheel form, am I right? They definitely meet my criteria for keeping meal time simple and low-maintenance. Two easy steps stand between you and this deliciousness: mixing up the filling all in one bowl and rolling them up! Please make these this weekend and report back. They are unreeeaalllll. If you can’t do cheese, simply leave it out or try this version of avocado chicken salad that will be right up your alley. It really is a delicious combination. If you’re looking for something with a hint of sweetness and a little crunch, my Pecan Grape Chicken Salad is a must try. – this is great for bringing to potlucks, picnics, or if you need a quick side dish for any meal. 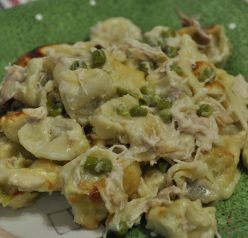 – I love that the filling is made all in the crock pot and all you have to do is roll and bake! You can also find out where to buy GoAvo for yourself by using their store locator. Enjoy! Party guests will love this Avocado Chicken Salad Pinwheels recipe. 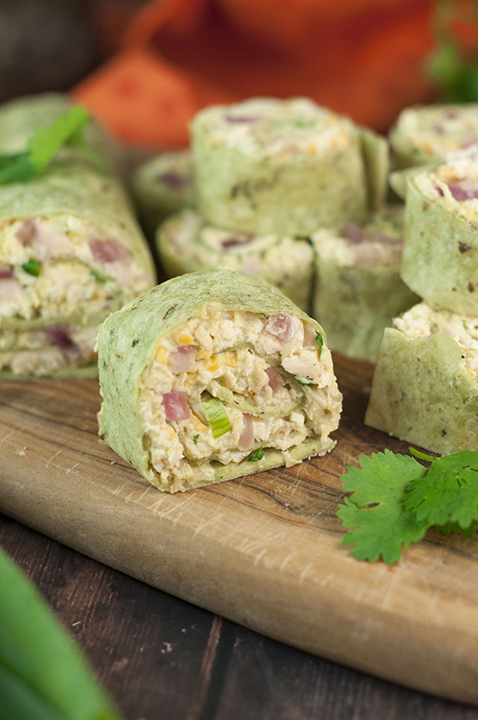 Chicken salad rolled in tortillas for a healthy game day appetizer, lunch or dinner! In a large bowl combine all ingredients for the avocado chicken salad. Mix until evenly coated. 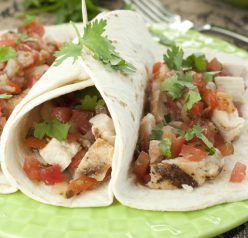 Using a spoon or offset spatula, spread the mixture over each tortilla, going all the way to the edges, and roll up tightly. Repeat this process with remaining chicken salad/tortillas. Slice with a sharp knife into 1 inch slices. You can slice them immediately or wrap tightly in seran wrap and refrigerate until ready to serve. Enjoy! Disclaimer: Thank you, GoAvo, for sponsoring this conversation. All opinions remain 100% my own, as always. We love chicken salad and we love avocados, so why haven’t I thought of this before? I am always bringing a boring deli meat wrap as my lunch and this sounds like the perfect way to jazz it up! I was thinking about making pinwheels a few weeks ago. This looks tasty and I love an indoor picnic! We do movie afternoon/night “picnics” in our living room a lot. Might have one this coming weekend! These look so good (and pretty)! I too detest mayonnaise like your husband. But….I am obsessed with anything avocado, so I am definitely going to have to check this out. Excited to hear I can pick it up at Kroger! I’m all about that avocado spread! Wish I had this for lunch today!